If you are looking for some great reading this weekend, look no further than the May Carnival of Children’s Literature! Melissa Wiley over at The Bonny Glen has put together a fantastic carnival this month, full of reviews and articles focusing on children’s literature. Yay! 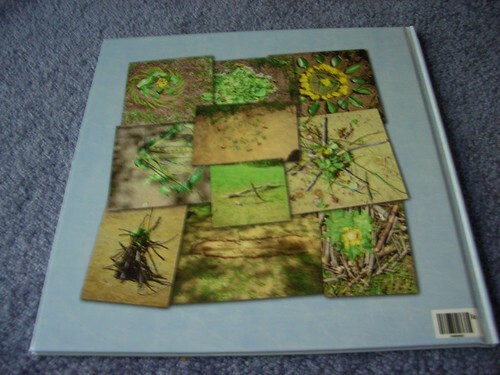 Today my class’ eco-art photobook arrived, and it turned out beautifully! 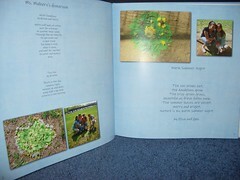 The book includes photos of both class’ eco-art and the poetry that it inspired in my students. 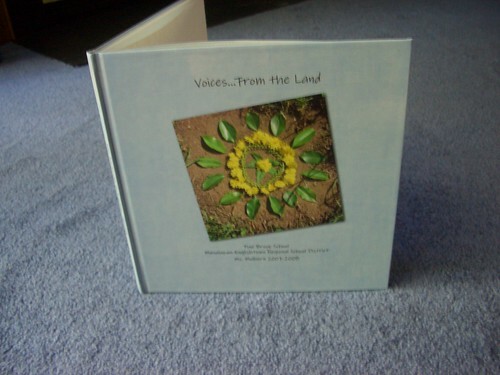 The book was created as part of the Voices….From the Land project through EIRC. The awesome back cover, a collage of the art created in our schoolyard. 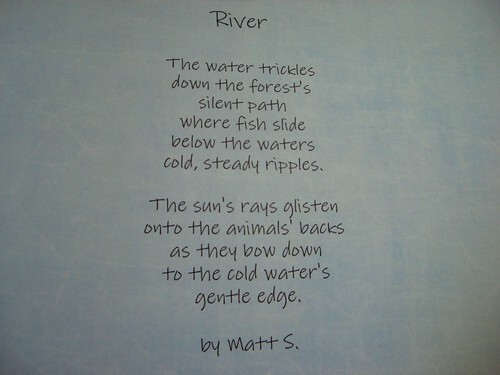 One of the poems that a student wrote after creating his group’s artwork. 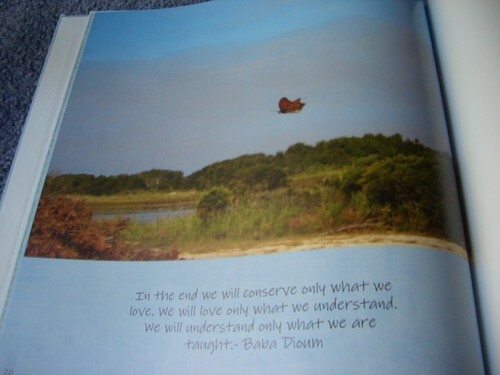 The final page in the book- a photo I took inCape May coupled with my favorite quote (and mantra). I am completely in love with this project. It is a great marriage of art, science/ecology, language arts, and technology. We will also receive books from two other schools (including one in New Zealand!). How cool is that? Even cooler? The fact that I might get to meet that teacher from New Zealand at a workshop this summer. Talk about making global connections in a new world, huh? Absolutely amazing. Right now, my two classes are completely obsessed with our read-aloud: The Lightning Thief (Percy Jackson and the Olympians, Book 1). I chose the first book in the Percy Jackson series as our final read aloud for the year because it is the perfect tie-in with my kids’ Greece unit in Social Studies. I love the entire series, and was hoping my kids would enjoy the book (and get hooked on the series over the summer). In no way was I prepared for complete and utter obsession that would result! My students are BEGGING to have more read-aloud time everyday. We stop and talk about the myths that Riordan alludes to and they are quickly becoming experts on Greek mythology. 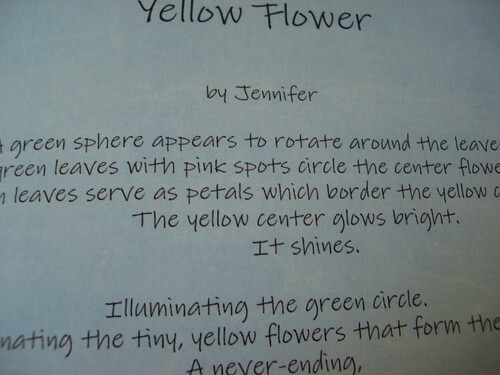 It is a perfect example of using a read-aloud to teach the content areas. My two classes have been reading the novel together and the other two classes on our team have not. During the Greece unit, their social studies teacher has commented numerous times on my class’ enthusiasm and knowledge about the mythology, gods, and goddesses. All of the knowledge has come from the conversations that spring from our read-aloud. No direct instruction, just conversations! As a sixth grade teacher, with almost 50 students, I see all sorts of books throughout the day. We just finished our standardized testing, so my students have been keeping a few books piled beneath their desks, to relax with after testing. Here’s a peek into a few of those piles. There, on the floor, I see the covers of two graphic novels. The first is Amelia Rules! Volume 1: The Whole World’s Crazy (Amelia Rules). That one has definitely made the rounds in my room. Across the aisle is the second book, a new favorite for my graphic novel lovers. Amulet: Book 1 (Amulet) is a big hit and my students can’t wait for the next book to come out. Some of my students prefer an old favorite during testing, to ensure they aren’t rushing through the test to get to their novels. The most popular choice? Diary of a Wimpy Kid and Diary of a Wimpy Kid: Rodrick Rules (Diary of a Wimpy Kid) by Jeff Kinney. The covers are bent, the pages dog-eared—these books are obviously well loved! Up in the front of the room I can see a few ARCs being read. Allie Finkle’s Rules For Girls: Moving Daythe dead and the gone by Susan Beth Pfeffer (courtesy of the author herself, making it hallowed pages for my students). The waiting list is a mile long and I can see that this student will be passing it on very soon. On a side note, this one would definitely distract me from any kind of testing! I can hear a muffled giggle on the far corner of the room. Shooting a glance I hope says, “I am so glad you are reading and loving your book but for heaven’s sake SHH! We can’t get in trouble!” When I see the book in her hand, I know why she is having trouble keeping a straight face. Her head is buried deep in Just Grace by Charise Mericle Harper, a favorite of mine. She later told me it’s the best book she has ever read! We may be taking our high-stakes standardized testing this week, but glancing around the room at my sixth-grade readers who are in the reading zone I know that those books in their hands say more than any test score ever will. These are readers, through and through. They may not all have been readers when they walked through my door in September, but they are all passionate, critical readers today! Each student has a favorite book or a favorite author. No one hesitates to pick up their novels when testing is completed, and they beg to continue reading when testing is completed and we begin classes for the day. That’s meeting AYP in my book! I have to admit- I am a crime show junkie. I never miss an episode of Law and Order: SVU, Without a Trace, or Shark. I watch the reruns of Law and Order on TNT. I love reading crime blogs online and web sleuth message boards. So when I received an ARC of The Year We Disappeared: A Father – Daughter Memoir by Cylin and John Busby, I was thrilled. Yesterday I sat down to read it and finished in one sitting. This is a thrilling YA memoir with huge adult crossover appeal. In this day and age of TV crime dramas, this true life tale of a family nearly destroyed by a brutal shooting will not go unnoticed! When Cylin Busby, now a a writer for young readers and former Teen editor, was nine years old she lived a normal live on Cape Cod. Then, overnight, her family’s life changed forever. A policeman in smalltown Falmouth, Massachusetts, her father is shot in the face on his way to work the overnight shift for the local department. The point-blank shots tear off John’s jaw, leaving it laying on the passenger seat of his car. While John is fighting for his life, he is also fighting to bring the perpetrators to justice. He knows that local small town, petty crimes and arsonist Raymond Meyer is to blame. However, Meyer holds the town and police department in the palm of his hand, and the investigation goes nowhere. Meanwhile, John’s family is placed under 24-hr surveillance while doctors struggle to repair his face. He can no longer speak or eat and is forced to spend months in the hopsital. Cylin and her brothers must live with constant police presence, including escorts to school, police officers guarding their classrooms, and a high-tech security system. This eventually leads to no contact with friends, as most of them are too scared to even speak to the family anymore. Worst of all, the shooter is still on the loose. With little being done by the local police department, John struggles with the anger he faces due to his injuries and the the revenge he so badly wants to enact on the man who has destroyed his family. Cylin struggles to come to terms with this new life her family is forced to live and her own fears. Over the course of a year, the family realizes that life can’t continue this way- and they disappear- moving to a new state, where no one knows them or their story. And they pray that no one from their old life finds them. The story is told in alternating chapters by John and Cylin. The reader experiences both of their lives through that harrowing year. From the shooting to its awful aftermath, the story is at times heartbreaking. It also shows how families can come together and rise above even the worst circumstances. Today, John and his wife, Polly, live in an undisclosed location. To this day, the man who shot John has never been prosecuted. His family still lives with the fear of retaliation in the back of their minds. Yet John and Cylin have decided to share their story in this jaw-dropping memoir of life on the run for an average family. In a future world, North America as we know it has been destroyed and the continent is now divided into 12 regions. The capital of this new nation, Panem, is in the Rocky Mountains and the remaining districts (1-12) are spread in descending order throughout the continent. Katniss lives in District 12, the last district, in what we call as the Appalachian Mountains. The closer you are to the Capital, the better off your district is. District 12 is in charge of mining coal and as the last district they are exceedingly poor. Starvation is a way of life and ever since Katniss’ father died in a mining accident, she has been in charge of caring for her mother and 12 year old sister, Prim. The capital is bent on reminding the districts who is boss and does this by withholding food, supplies, and other necessities. Their trump card is the annual Hunger Games, which are held to ensure that no district makes an attempt at a rebellion or uprising. The Hunger Games are a like a combination of American Idol and Survivor, with Roman gladiator games tossed into the mix. Each district is required to supply one male and one female child between the ages of 12 and 18 for the annual event. The competitors are chosen via a lottery system. Families can buy more food and supplies for the year if they purchase additional entries into the games. Thus, the poorer you are the more likely it is that you have dozens of entries in the mix. The entries compound each year, so there are children with dozens of entries in the mix. Those who are well-to-do have fewer entries, with some only responsible for one entry. (In other districts, wealthier ones, children are raised for the opportunity to participate in the Games. These “Careers” see the games as an honor). Ever since her father’s death, Katniss has been forced to purchase extra entries to ensure the survival of her mother and Prim. This, coupled with her talent for illegal poaching/hunting, has allowed them to live as comfortably as possible. Each year she hopes and prays that she is not picked, as the entire nation watches the drawing live, either in person or on their television. This year is different, however, as Prim is old enough to be entered. Katniss has not allowed her to gain extra entries, so she has only her required entry into the games. When Prim’s name is drawn, Katniss immediately volunteers to take her place, an old custom that has not been called into action in District 12 in many years. Katniss and Peeta, the two competitors chosen from District 12, are immediately swept into a whirlwind of events that eerily resemble our culture’s obsession with reality TV. They are whisked to the Capital, where they receive stylists, makeovers, interview coaching, and gourmet food and living accomodations. While Peeta and Katniss slowly become friends and come to terms with their fate, they also realize that in order for one of them to survive, they must kill the other. You see, the Hunger Games leave the 24 competitors in a secret location (desert, tundra, etc) and the competitors must fight to the death. While the entire nation watches live on TV. The sole survivor wins food and supplies for their district for the next year, and set themselves up for life. I read this novel in less than a day. The action is non-stop and heartpounding at many points in the story. Katniss is a likable character: she isn’t perfect, she isn’t a moral compass, and sometimes you even want to hate her. However, the situation she is thrust into is eerily similar to the modern-day obsession with reality TV and you can’t help but wonder if this the frightening direction into which we are headed. Collins never mentions a year in the novel, so it could be tomorrow or a thousand years from today. That in itself will keep you engrossed in the novel. The story is violent and writhe with betrayals, but there is also kindness, love, and drama. This is one novel you will not be able to put down. This is the perfect start to what should amount to a fantastic trilogy. *For anyone who enjoyed Susan Beth Pfeffer’s Life As We Knew It and the dead and the gone, Collin’s Hunger Games should be a natural choice. I have to admit- I am not a graphic novel reader. Sure, I will read one, but it’s never my first choice. I think it’s because I read so fast and I tend to skip the pictures to get to the words, and then I have to go back to the pictures. It just slows down my normal reading pace. 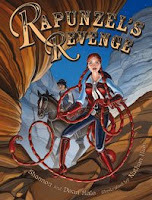 However, I was absolutely thrilled when I received an ARC of Rapunzel’s Revenge from the publisher. I read it in one sitting last night and can not wait to pass it on to my students. What a phenomenal story! First, let’s begin with the size. The ARC is 7 1/2 x 10 7/8. It’s bigger than your average book and it serves the illustrations well. Nathan Hale’s (no relation to the authors) illustrations are just gorgeous. I am not a “picture person” when it comes to books, hence my tendency to avoid graphic novels. However, Nathan Hale forced me to linger over each and every panel! The illustrations are beautiful and there is just so much going on in every one! As for the story, WOW! First of all, I so admire people who can co-write. I can barely manage to write on my own, and coupled with the fact that I am a control freak, I can’t imagine writing with someone. 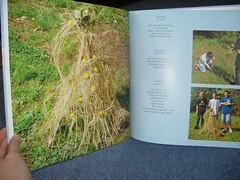 However, Shannon and Dean have crafted a fantastic fairy tale re-telling of Rapunzel’s story. A much, much better story than the first time around! The story is in direct contradiction to the original in many parts, but that’s what makes it so great. Rapunzel is strong, witty, and smart. No damsels in distress in this fairy tale! The world she lives in is a mix of the Wild West and a fairy tale world. Sounds crazy, right? It works. And it works great! This is going to be the perfect graphic novel for reluctant readers, fairy tale lovers, readers who love fairy tale retellings, and anyone who loves books that make you laugh out loud. 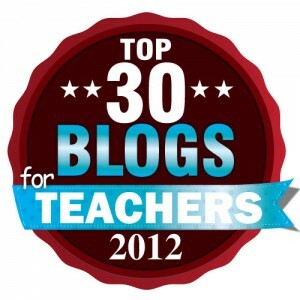 I can not wait to pass this one onto my students. I can already foresee the fight that will break out over who gets to read it first. And second. And third. And so on!